Everyone has memories of multiplayer mayhem to share, maybe about the magical bullet that only just whizzed by as they scored the final blow, or of that impossible streak of 50 kills that ended with each player to a man celebrating the accomplishment. 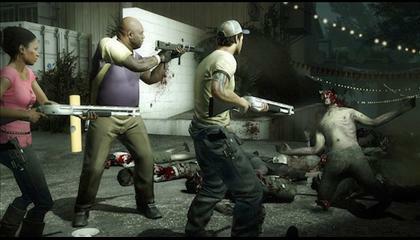 While moments like these are fairly common in modern day shooters, the original Left 4 Dead managed to create a new type of multiplayer narrative. Players now share war stories of the malicious Witch that dove on her victim at the least opportune moment, of the crafty Smoker that used his tongue to pull a survivor off the edge of a skyscraper, of the gargantuan Tank that leapt into the escape boat to destroy an unlucky sap moments before the credits rolled. With Left 4 Dead 2, Valve has somehow upped the ante in every conceivable way, ensuring that its survivors will have far greater (and even more exaggerated) stories to tell. Like its predecessor, Left 4 Dead 2 is a cooperative-focused first-person shooter featuring four enigmatic survivors banding together to blast through a zombie infestation. The new cast of characters is an eclectic crew, with the somewhat droll duo of Nick and Rochelle completely upstaged by good ol’ boy Ellis, who constantly tells stories of his cousin’s misadventures, and Uncle Phil lookalike Coach, who’s seemingly quite annoyed by all of this zombie nonsense. This quartet must travel through a variety of Southern US locales, including a carnival (complete with demonic clowns), a swamp, a shopping mall, and even the demolished streets of New Orleans. All five of the hour-long campaigns are unique and original. They embody a lighter, funnier, and more playful tone than that of the original game. From a factory full of Witches and a vision-obscuring rain storm to exploring the “Tunnel of Love”, the off-the-wall insanity and unpredictability of the mission design makes each moment feel different than the last. Valve has also spiced up the campaign’s finales to a ridiculous degree. While I won’t spoil them here, I will say that they are all far more interactive and exciting than the original’s wait-for-the-escape-vehicle endings. Equally spicy are the new types of special infected, which include an acid-spitting wench, a head-pouncing jockey that steers you towards zombies, and even a mini-Tank called the Charger that can smash your skeleton into shards of calcium with one mighty blow. These new creatures combined with the original’s menagerie of special infected play a much bigger role this time around, as two or three of them are bound to appear in nearly every scuffle. Thankfully, the zombified citizens of the South have left an arsenal of all new melee weapons around for your use. These include axes, frying pans and even a deliciously powerful chainsaw. While the melee weapons may not seem like big additions on paper, but the versatility that they provide is unmistakable. In the original, you would often be helpless when swarmed by a large group of infected; guns didn’t reload fast enough to take them all down and your friends were probably too busy keeping their own hides safe. 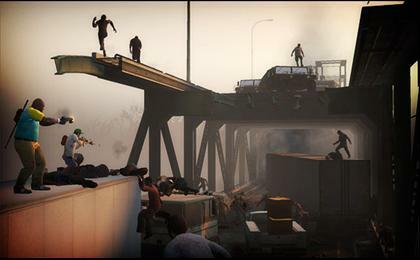 In Left 4 Dead 2, one untamed swing of your machete will send a dozen zombie heads tumbling towards the pavement, allowing you to crawl out of tight situations much easier than before. Left 4 Dead 2’s four player online cooperative mode—the bread and butter of the game–was smooth and lagless during my testing, though finding good partners before venturing into online waters is absolutely essential. Surprisingly, the difficulty of the Normal setting has been increased exponentially from its predecessor, mostly due to the new special infected that populate the playing field. While it’s not impossible, quickly agitated gamers might want to stick to Easy for their first few runs, as replaying levels has been a fairly common occurrence online in my Normal mode playthroughs. The Versus and Survival modes also return from the original, bringing with them a Scavenge mode in which players collect gas canisters while the special infected try to stop them. While its limited focus doesn’t give it the longevity of titles like Modern Warfare 2, being able to play as the special infected makes Left 4 Dead 2’s competitive modes unlike anything else out there, offering a welcome relief from the tired grind of traditional online shooters. When offline, the survivors’ artificial intelligence do an admirable job of watching your back and throwing you health packs, but I did run into a few cases where they heartlessly abandoned me to the zombie masses. Despite that, I would strongly recommend running through the campaigns in single-player mode first, as it lets you get a feel for each environment and character, as well as a chance to hear all of the hilarious dialogue without the din of online idiots ruining the mood. Speaking of the dialogue, the voice acting is superb across the board and the music brilliantly blends familiar Left 4 Dead themes with bayou strings and New Orleans brass instruments to create one of the most uniquely perfect soundtracks of 2009.